This Taste of Lebanon Still Lingers……. Falafel’s, the Lebanese Haus, I heard had undergone a menu change. Why I wondered, as I loved its offerings anyway. One of the few places in Mumbai serving authentic Lebanese fare, albeit with a bit of a contemporary twist. A new exciting outlet at Gowalia Tank in South Mumbai was what was the reason. And yes, there were some menu changes too, but, with the regular favourites in tact. Now that was a huge relief. Their commitment to healthy, quality fast food has made them a favourite of many and I am no exception. I decided to check it out. I made my way to the small, bu swank QSR outlet at Gowalia Tank. The falafel section in the menu, had increased, with some exciting options. There were some new multi-grain wraps too. I opted for the Greek falafel and my colleague for the Mexican one. Mine came in a whole wheat pita and his in a wrap. The falafels were crisp and the filling absolutely authentic. The soaked chickpeas were well grounded and seasoned with onions,spices like parsley, garlic, cumin and coriander et al. The fresh and juicy salad and sauces along with it were equally delightful. An exciting array of flavours flooded my mouth. An extremely filling meal it turned out to be. 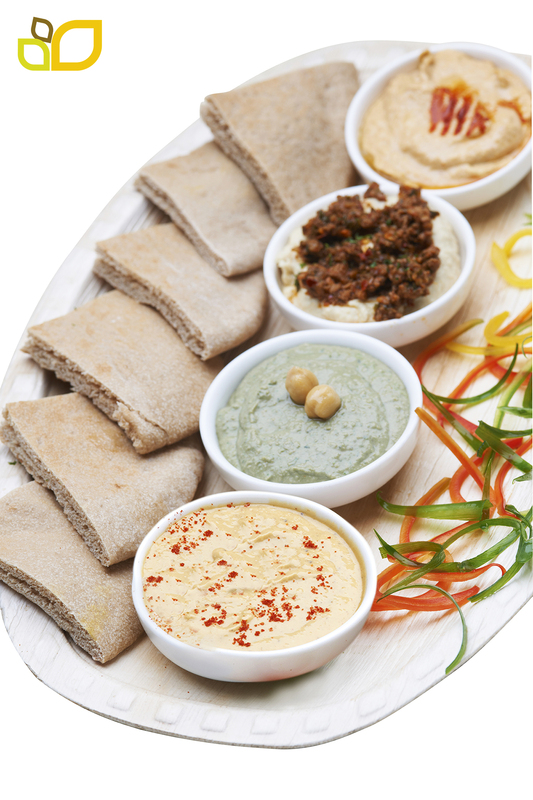 The repertoire of hummus and dips that have been added are astonishing. I particularly loved the spicy tirokafetri. The lemonade too was much more refreshing than before. It clearly has undergone a makeover. Chocolate Nachos with vanilla ice cream is a new entrant. The dessert section now looks good. The nachos, made in-house are exquisite. Perfect texture and taste. 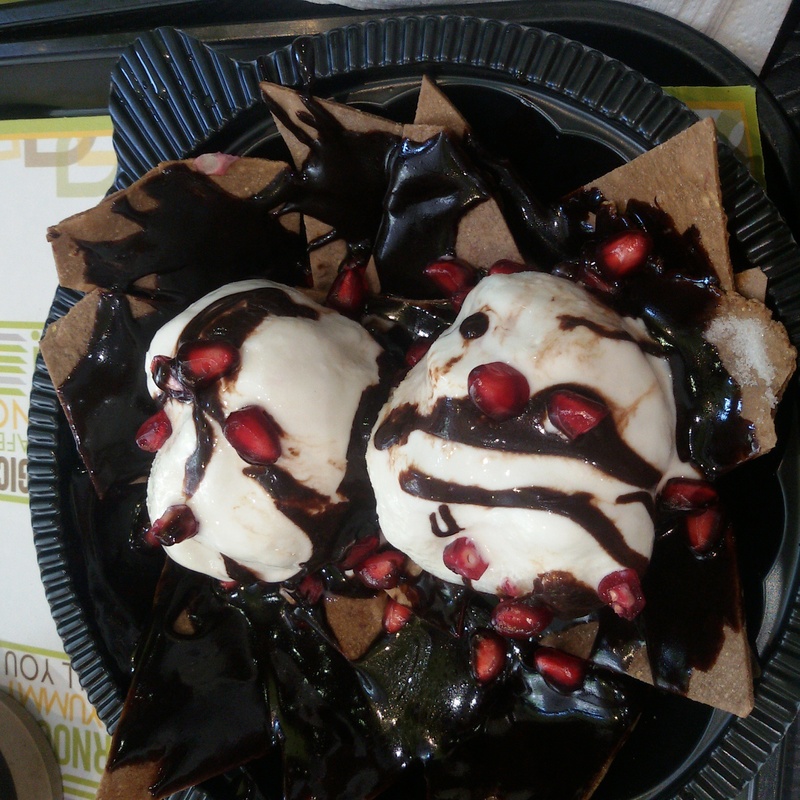 Swathed in chocolate sauce, these were sinful. The ice cream however was a bit disappointing and took away the oomph factor from the dessert. A special mention must be made of the Oreo Date smoothie, which was more of a dessert for me rather than a thirst quencher. The balance of the two main ingredients was perfectly achieved. Not too sweet and yet, the taste of the dates was evident. Utterly refreshing. Kids are going to love this one. Full marks here to the chef. The menu has a myriad options to tantalize various palates. Salads, wraps, hummus platters, combos, little bites. A plethora of options to choose from. There are Jain dishes too. For Lebanese cuisine to make this offering. is indeed unparalleled. The overall experience at Falafel’s was a memorable one, both in terms of service and for the palate. I can’t wait to have one closer home in Oshiwara again. It was a dinner with a difference. Jacob’s Creek, extended The Reserve Table experience with the ‘Longest Reserve Table’ in Mumbai at The Terrace Garden at ITC Grand Central. It was elegance personified. The ITC Grand Central Team did a fabulous job of the decor, service and of course food. The service too was impeccable, as expected with clockwork precision. The ‘Longest Reserve Table’ in Mumbai witnessed more than 100 gourmands who had reserved a seat at the table to be a part of this unique experience. I was privileged to be one of them. Adrian Pinto of Jacob’s Creek, played the perfect host, introducing the wines and ensuring all his guests were enjoying themselves. Jacob’s Creek Reserve wines were perfectly paired with a well -curated menu by ITC Grand Central’s Executive Chef Bhaskar Sankhari. The versatility of the wines was evident. My vote went to the Chardonnay. Have a special soft corner for that one. The Sparkling Rose too was refreshing. The ITC chefs were challenged to push boundaries and create flavours to complement select wines from the Jacob’s Creek Reserve range sourced from some of Australia’s most premium wine regions- the Barossa Valley and the Adelaide Hills. And I can safely say the Chefs came out tops. Kuldeep Bhartee, General Manager, ITC Grand Central Mumbai said, “This is indeed a unique way to showcase the exquisite menu crafted by our Executive Chef paired with fine wines.” I couldn’t agree more with him. The experience commenced with ITC’s signature hors d’oeuvres with Jacob’s Creek’s signature sparkling wine, the Chardonnay Pinot Noir Brut Cuvee. Indeed the food served, complemented the wines. The dum cooked chicken mince kebabs with sheermal or the vegetarian gucci badam ke shikampur were an apt match for the Jacob’s Creek Classic Shiraz Cabernet. The robust spicy red fruit and cherry bouquet with the soft tanins and fruit flavours on the palate was an unparalleled treat. I loved the pudina paani and citrus granita in between as a palate cleanser. My favourite wine the Chardonnay arrived with the Gosht ke nihari and taftaan. A sublime treat for the palate. The experience reached its Nadir with the Gosht Bohri Biryani and Kathal Ki Biryani impeccably paired with Jacobs Creek Reserve Barossa Shiraz. The dessert- saffron and almoroso flavoured baked rosogulla was a creamy treat. The delicate pink Sparkling Rose did justice to it. 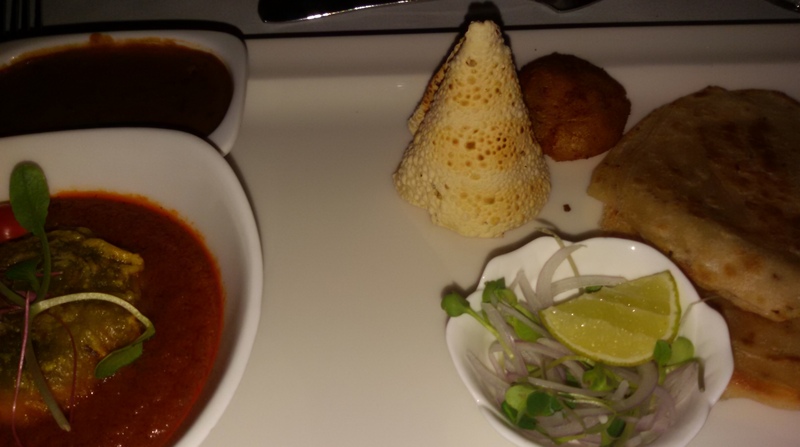 ITC Hotels’ Indian spread is undisputedly the best in the country. I can never tire of it and love the way Chef Sankhari and his team keep reinventing the menus. An enjoyable evening of tantalising food flavours and the best of wines. Have not enjoyed a wine dinner so much in a long time. There couldn’t have been a better way to usher in Gudi Padwa! Buffets are always exciting because of the spread and variety but yes, sometimes, the food quality can be a bit of a concern. Was thus delighted to learn about the Anti Buffet luncheon at Mamagoto’s outlet in Andheri West, Mumbai. This much loved Pan Asian restaurant chain known for its fun, quirky Asian cuisine has done it once again. Mamagoto indulges you by enabling you to select what you want to eat and how you want it. The Live wok station looked very inviting. I was ready to experiment. With an array of sauces and meat such as lamb, fish, shrimp, chicken to choose from, the chef in me was surfacing. I selected my combinations of veggies and meat in a black pepper sauce. Voila! my dish was ready. Crunchy, crispy and fresh veggies and meats enveloped my mouth. The burst of flavours left me speechless. The welcome drink with water melon juice as the base was refreshing and apt for a hot afternoon. Of course the other starters were equally delectable. The South East Asian grilled fish swept me off my feet. The flavours were so delicate, yet, pronounced. 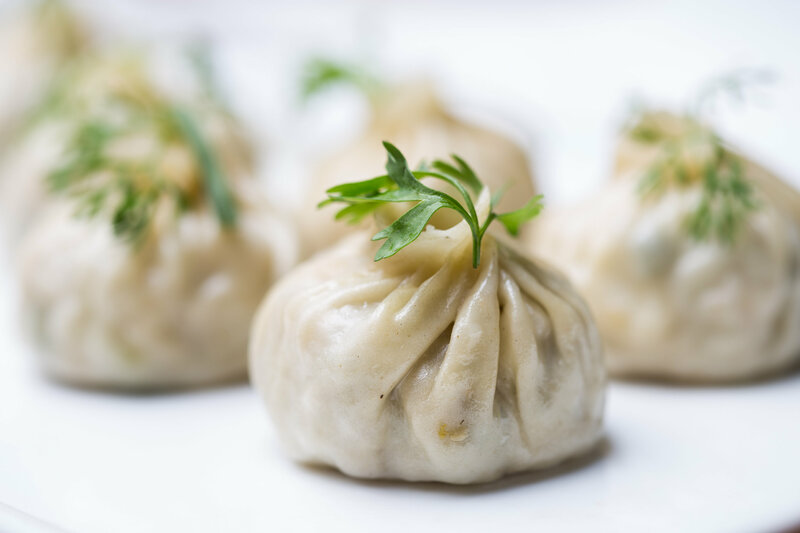 The momos were ordinary as were the spring rolls. Although I liked the fact that the spring rolls were not oily.The Hungry Soul broth with a generous dose of veggies and chicken was genuinely comforting and satiated us completely. 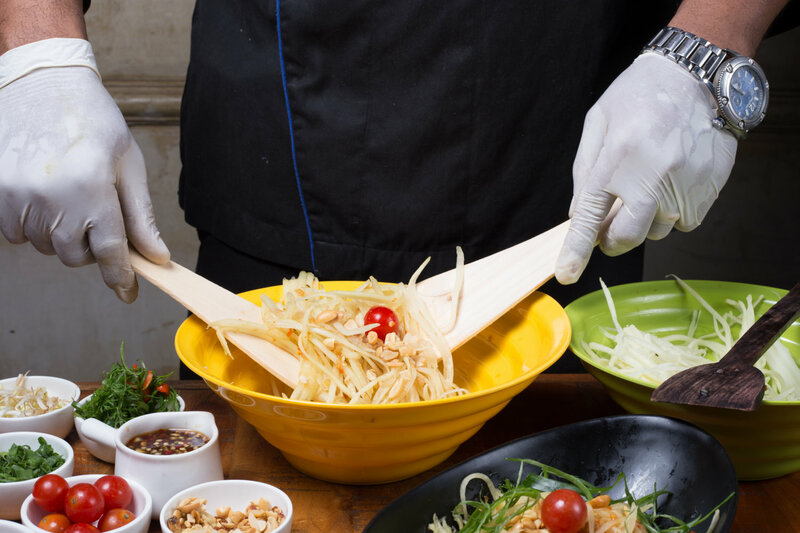 The Asian salad station offered Som Tam, Glass Noodles, Asian summer Salad, Mix veg salad with peanut dressing (baby corn, chinese cabbage , pokchoi, green beans, long cut , cucumber cubes) and one could tweak it as per one’s own preference. In the mains, the stir fried pak choy with water chestnut, bowled us over. The crunchy water chestnut paired exceedingly well with the subtle pak choy. A real palate pleaser, this one! By the time we reached the dessert part of our meal, we were actually quite full. Caramel sponge cake, Chocolate mud cake, Banoffee pie and Coconut ice cream were on offer. A scoop of ice cream was all that we could manage. “We believe in empowering our clients, giving them the luxury of choice and asking them to dictate what they want, when they want. The idea is to create a paradigm shift and give people an alternative to the mundane, old fashioned spreads.” I liked what Rahul Khanna & Kabir Suri, Directors, Azure Hospitality Pvt. Ltd, the promoters of Mamagoto told me. What a perfect approach. Priced at an attractive rate of Rs 599 the ” Anti Buffet ” lunch is a steal and a great way of enjoying a delicious Pan Asian meal. Available from 12-3 pm from Wednesday to Sunday, make sure you don’t miss this one! A restaurant on wheels is always a fun prospect to eat from. Of course extremely popular in the West, one does not see too many in India owing to licenses and permission problems, yet, thankfully, a few are mushrooming all over India. Delhi and NCR seem to be leading the way. 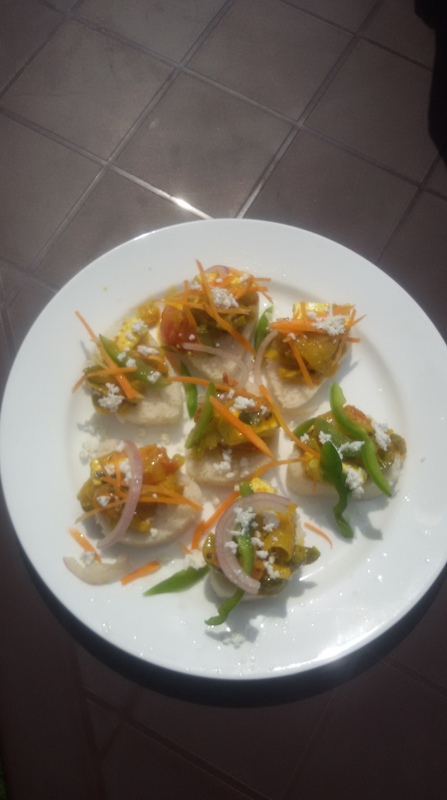 I was lucky to sample the food from Kobri, a food truck parked at The Heritage Transport Museum, one afternoon, courtesy, Le Meridien Gurgaon. The menu for the day was on the blackboard outside the truck and the chefs lead by Rajneesh Kumar, Head Chef, Flavour Labs, were chopping, mixing, preparing, frying at a frenetic pace. The excitement as building. South Indian fusion food is Kobri’s speciality. After all, Kobri means coconut in Kannada. 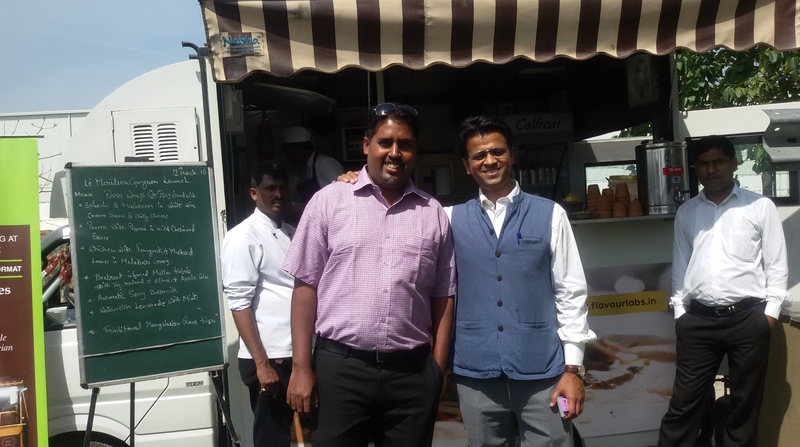 This unique food truck is part of a hospitality setup called Flavour Labs and was conceptualised in 2013 during the Stanford Business School’s Ignite program in Bangalore. Launched in October 2014, Kobri is based in Gurgaon and mostly caters to the larger NCR region, Rohan Rajgarhia, one of the partners informed me. The founding team comprises of entrepreneurial professionals with a passion for incredible food experiences, who have backgrounds in hotels & hospitality, healthcare, corporate strategy, analytics, customer service; and academic/professional affiliations with Stanford, Cambridge, Harvard and IIT. South Indian food is something most of us enjoy, but the fusion bit was the intriguing part. Spinach and mushroom in a white wine cream sauce topped with cheese and chilly flakes was what I settled for, in a wrap. I had made a good choice. The wrap was crisp and the filling generous. The medley of spinach and mushrooms was flavorsome and the white wine cream sauce, laced with cheese gave it a smooth texture, which led to a burst of flavours in my mouth. It was sumptuous, the veggies crunchy and affordably priced. All the prerequisites to make it work for office goers looking for a quick, filling and healthy lunch. Aaiyyo! Delectable stuff. The spiced mutton kababs served with salad greens and an apple and olive salsa were equally unique and interesting. 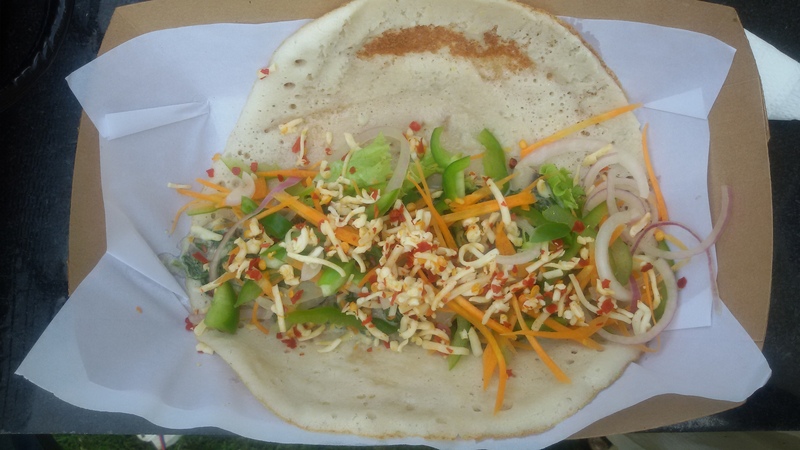 However, I preferred them on idlis rather than in the wrap form. Other options include Paneer with assorted peppers in a mild chettinad sauce and topped with salad greens, Crispy fish on a bed of beetroot and turnip roulade, served with in-house tartar sauce and fresh greens. I like the twist Chef Rajneesh has given to the dishes. 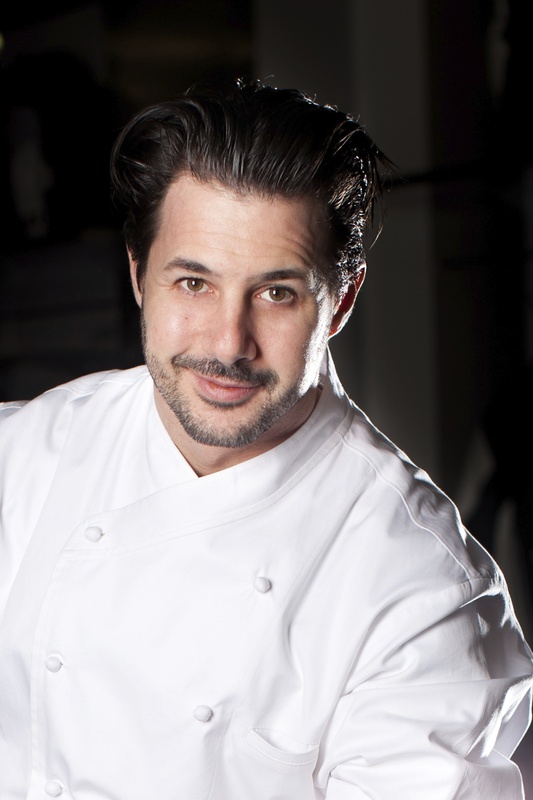 The flavours are contemporary and global, appealing to all taste buds. Yet, if one is craving for a South Indian meal, these, satiate that urge too. The idli subs I thought were cute and yet, filling. With offerings ranging from Rs 140-180, food is an absolute steal. Apparently they have another truck called Hoppers that offers healthy comfort food. I can’t wait to try that on my next visit to Delhi and NCR. Alas! we need a Kobri in Mumbai too! Who does not enjoy munching on snacks and when the snacks are tasty and healthy, nibbling becomes so much more fun and one can indulge guilt free. That is exactly what I did when The Nibble Box delivered my box of snacks at my doorstep yesterday. The Nibble Box is the first online snack-subscription service in India. The array of snacks were beautifully packed in a cardboard box, each in an individual packet. There was Kiwi Kayak, Smoky Scuttle of Nibbles, Java Chip Latte and Fig Flaps. It was an interesting mix of sweet and savoury snacks. The Kiwi Kayak was delightful. Pieces of dehydrated kiwi, pumpkin seeds, black raisins, goji berries, almonds and dark chocolate chips were part of the Kiwi Kayak pack, which was extraordinary I thought. Good for Vegans too. The Fig Flaps, were generously filled with figs and made for a hearty snack. Full marks here too. The Java Chip Latte satisfies your sweet cravings. Loved those too. Filling and made, using the best of ingredients, I thoroughly enjoyed my nibbles. What’s more, the ingredients of the snacks are handpicked. 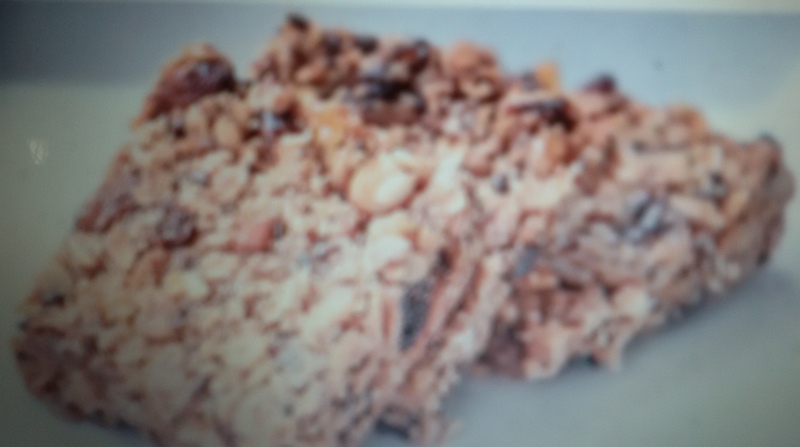 They offer over 100 snack recipes that include nuts, dried fruits, seeds, granola bars, and other home-style recipes. There is something for everyone. One can subscribe for a month, three months or six months and one box of 4 snacks is delivered every week. And they are affordably priced. Throughout one’s subscription,a snack is generally never repeated. One can thus enjoy different snacks every week. It is a wonderful concept and much-needed in India where we love our evening snacks. 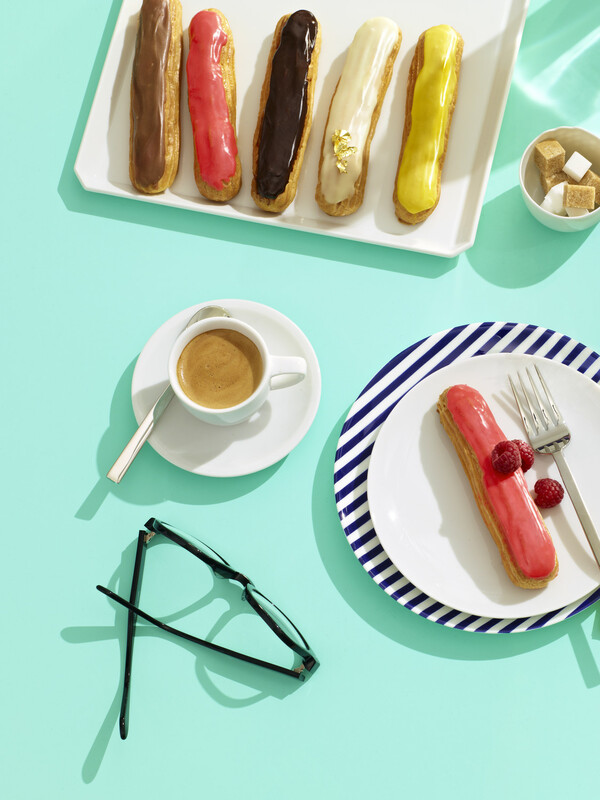 What sets them apart is there are no artificial colours, flavours or sweetners used. The Nibble Box is one simple solution to one’s daily dilemma of deciding what to munch on and that too without consuming too many calories. 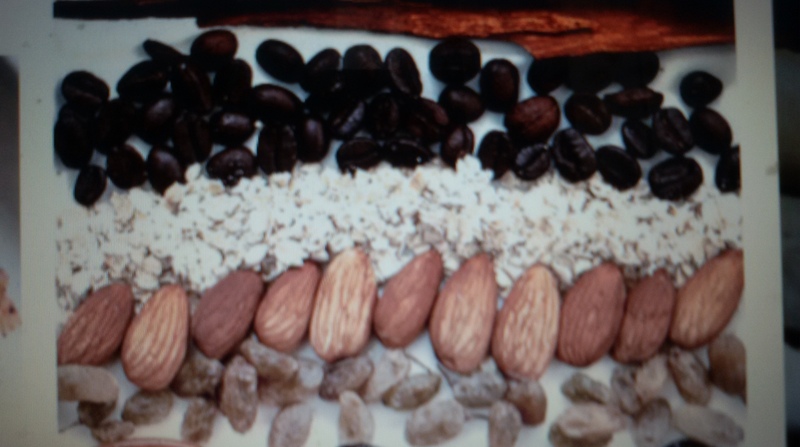 The fact that their snacks are also nutritious, helps one maintain a balanced lifestyle. Perfect for kids, health conscious people, gym goers and many more. I have at last found a solution to my evening cravings? Have you?